The American Land Title Association (ALTA) Best Practices are a benchmark for the real estate settlement and mortgage lending industries. Increased regulatory demands have forced lenders to evaluate their relationships with service providers. To help meet this need, ALTA created the Best Practices framework to help highlight policies and procedures the industry exercises to protect lenders and consumers, while ensuring a positive and compliant real estate experience. They illuminate the high level of professionalism that title agencies follow to protect consumers and businesses in the real estate and mortgage settlement. ALTA’s Best Practices assessment process allows industry professionals to demonstrate to consumers, lenders, and other parties who may contract their services that they have adopted policies and procedures in compliance with the Best Practices standards. 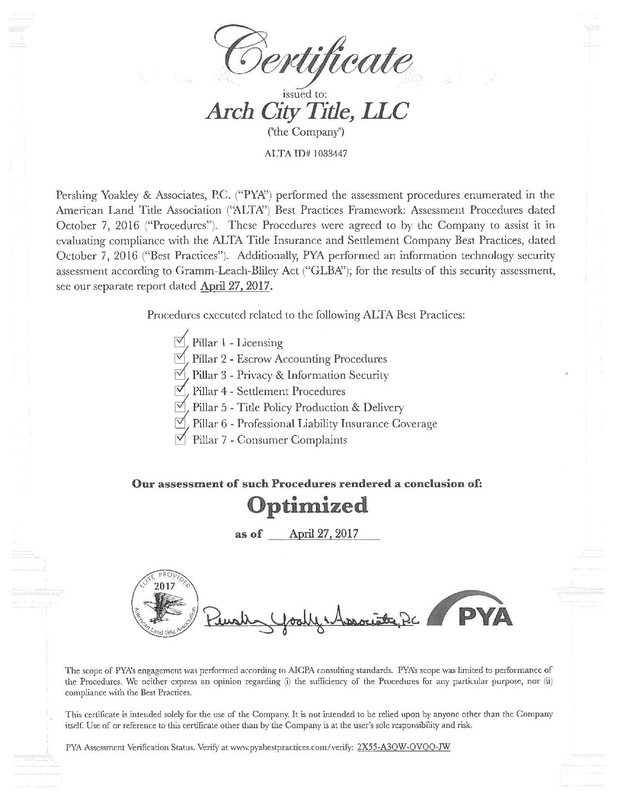 Arch City Title is proud to have consistently earned a third-party Best Practices Certification from the firm of Pershing, Yoakley, and Associates.